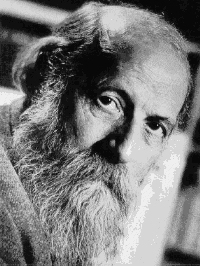 Martin Buber (1878-1965) was a Jewish philosopher who did a great deal to put classic documents of Hasidic tradition into wider circulation. He is most famous for his 1923 book I and Thou. I and Thou is a remarkable book, a masterpiece of simplicity and direct communication. I don’t know if it will ever seem as important again as it did for a while in the 1960s, when $5 Scribner paperback copies of it blanketed college campuses and everybody had to footnote in every discussion. But it has all the marks of a classic text, a great book: It draws you in with an immediacy that has you thinking the author’s thoughts along with him before you can stop yourself. By the time you back off and get some critical distance, you realize you have to start using big words like existentialism and dialogical personalism to describe the thoughts you’ve been thinking. The other primary word is the combination I-It; wherein, without a change in the primary word, one of the words He and She can replace It. Primary words do not signify things, but they intimate relations. Primary words do not describe something that might exist independently of them, but being spoken they bring about existence. Primary words are spoken from the being.